Greetings, dear readers, and happy Monday! I hope you had a wonderful weekend! It has been a busy one for me as I have been out of town for my husband's family reunion, but I will be returning home soon. Now on to today's blog post! One of the brands I had the pleasure of visiting with while attending Cosmoprof North America is Skinn Cosmetics, and I am happy to share several new items with you today! Skinn Cosmetics is not a new-to-me brand, and I have enjoyed seeing the direction the brand has taken with both skincare and cosmetic items. I'm still testing the skincare items I brought home with me from the show, so I thought I would share the cosmetic items first. Let's check them out! This new and improved eye shadow primer contains orchid flower extract and a blend of white lily and apple extracts to help hydrate, firm, and smooth your eyelids, giving you the perfect canvas to apply your eye makeup! The Orchid Gel Canvas-Ready Treatment Eye Primer is a silky smooth blend of lightly tinted state-of-the-art silicones, pigments, and micropowders that glide effortlessly on your lids. After trying this out, my lids have been left with a smoother finish and already look brighter than they did prior to application. After applying my eyeshadows, I was impressed with how well this primer functioned to extend my eyeshadow wear and prevent creasing. It's certainly a product worth picking up when it launches! At the time of this post, the Orchid Gel Canvas-Ready Treatment Eye Primer with Orchid Flower Extract is scheduled to launch in March 2018. This eyeshadow palette promises a crease-proof, transfer-resistant, long-lasting and effortless look with four complimentary shades designed to hold their color all day long. The cream eyeshadows are all contained within individual sealing pots inside a flip-open compact alongside a double-sided application brush and a mirror. 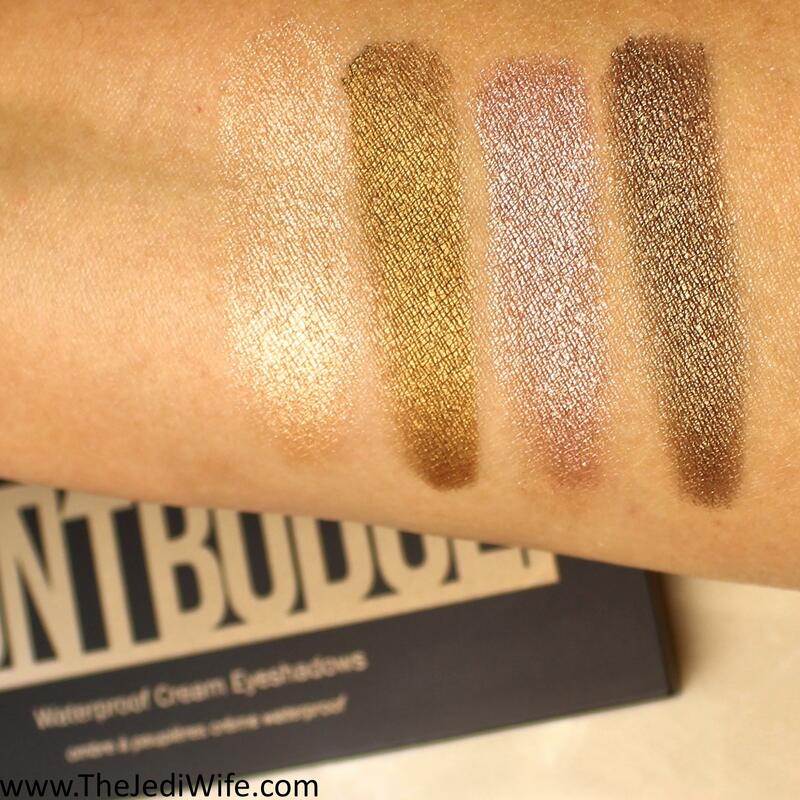 The Don't Budge Cream Eyeshadow Palette is available in both a non-matte and matte version. Show above is the shimmery, non-matte version. 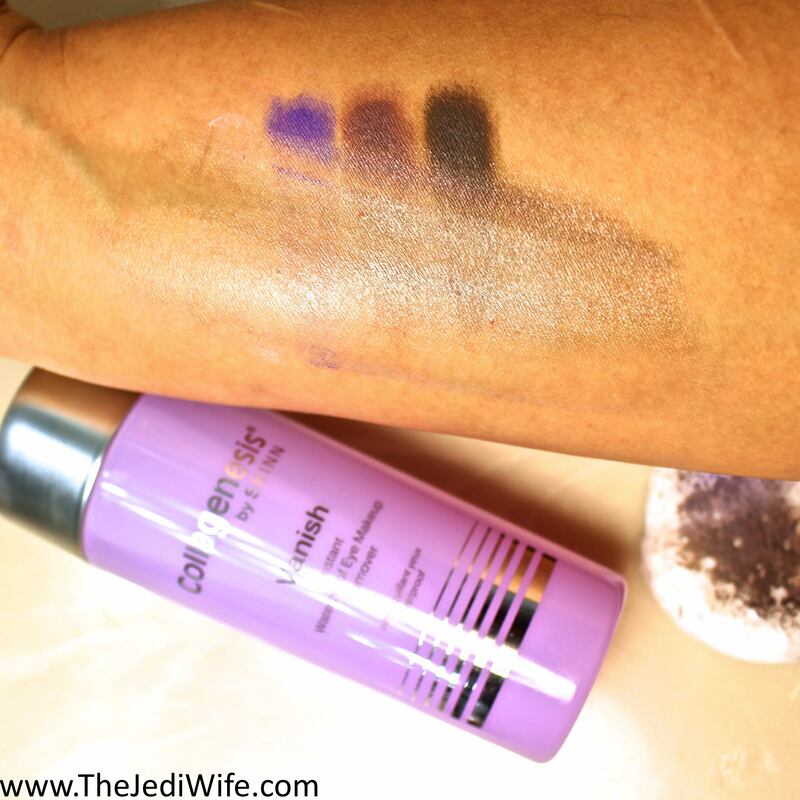 All four shades are beautifully pigmented and swatched effortlessly on my arm. 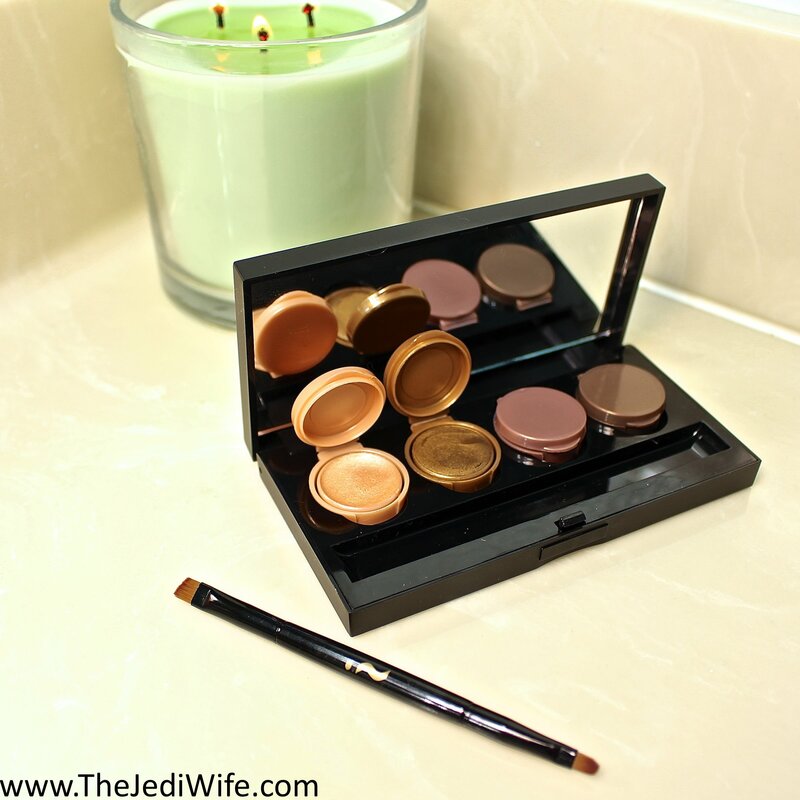 Above is the matte version of this cream eye shadow palette. While all four shades are quite pigmented, the application of two of the shades was trickier. The pale pink on the far left swatched easily enough; however, it is not particularly pigmented. 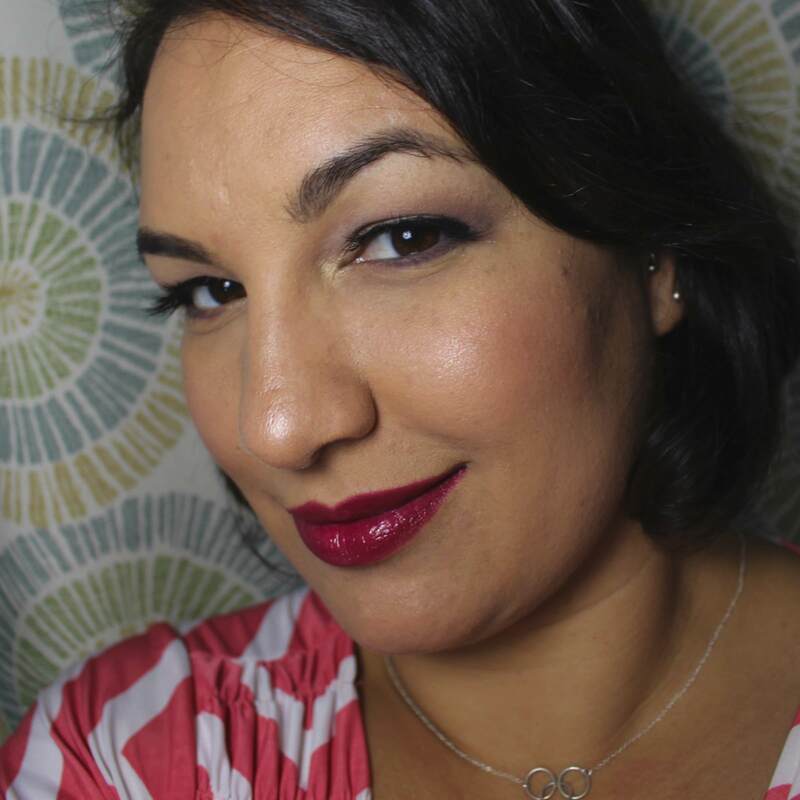 It disappears easily against my skintone, and I have swatched it twice here in order to get it to show on my skin. The other shadow that gave me trouble was the purple. It is nicely pigmented, but as you can see in the photo above, the finish is very patchy and uneven I swatched two layers of the purple, and while it did help even out the colour some, I am sad about the overall quality of it. The two remaining matte shades swatched beautifully and are nicely pigmented. Once the swatches of both the mattes and non-mattes dried on my arm, these eye shadows were not going anywhere! I couldn't remove the strips of eye shadow easily (or at all, for that matter!) with my facial wipes, although they did come off easily with following eye makeup remover. Oil-based and nutrient-packed, this rich and luxurious formula instantly melts away stubborn makeup with a blend of chamomile, olive, and marula oils. Vitamin B5 and plant-derived acacia collagen aids in soothing and hydrating skin, all while strengthening and conditioning delicate lashes. Because the new Don't Budge cream eyeshadows are budge-proof, what better way to test this eye makeup remover than to soak a cotton pad and see how easily is would remove my swatches from my arms! As I mentioned previously in this post, these cream eyeshadows were definitely not going anywhere, even with the usual pressure I exert with my facial wipes. I unscrewed the cap from this remover, partially soaked a cotton pad, and gently wiped two or three times on my swatches. This product was highly effective in removing the waterproof eye creams without any rubbing or scrubbing! When I was done, it left my skin clean and soft. I've also used it to remove makeup from my eyes, and I like how easily it works and I don't have to worry about it causing damage to my delicate eye area! 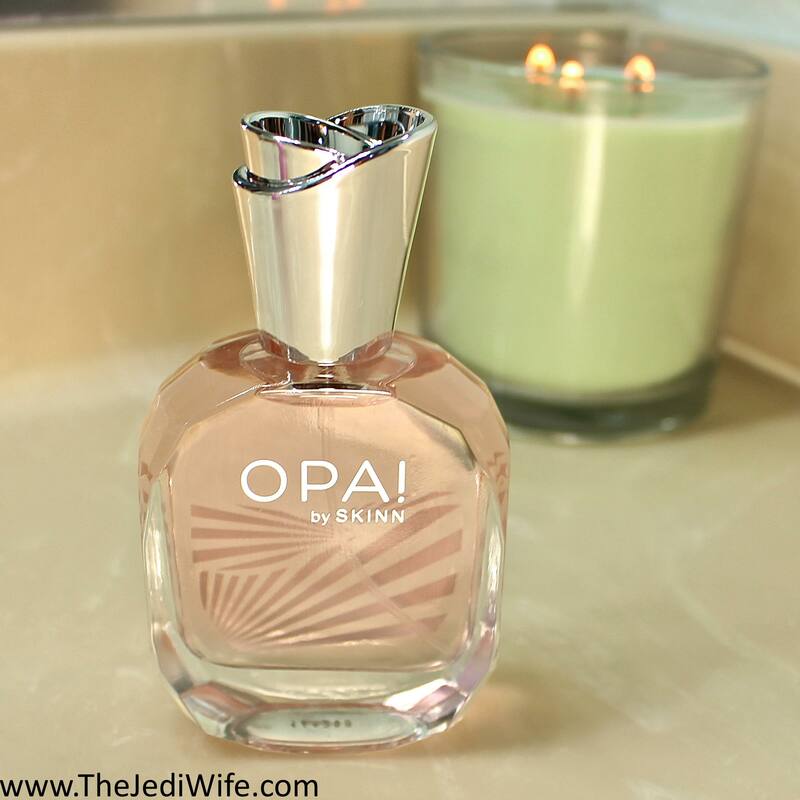 While not particularly new to the Skinn Cosmetics lineup, I just had to include the gorgeous OPA fragrance in this blog post! Opa is a Greek exclamation of celebration, and what a wonderful fragrance it has inspired: soft citrus top notes are balanced with the floral notes of peony, lily-of-the-valley, and rounded out with a touch of woody vanilla. OPA! is warm and feminine, and a popular scent for Skinn Cosmetics. While it is currently available as an eau de parfum, OPA! will soon be available in a Satin-Finish Body Oil and a body butter. 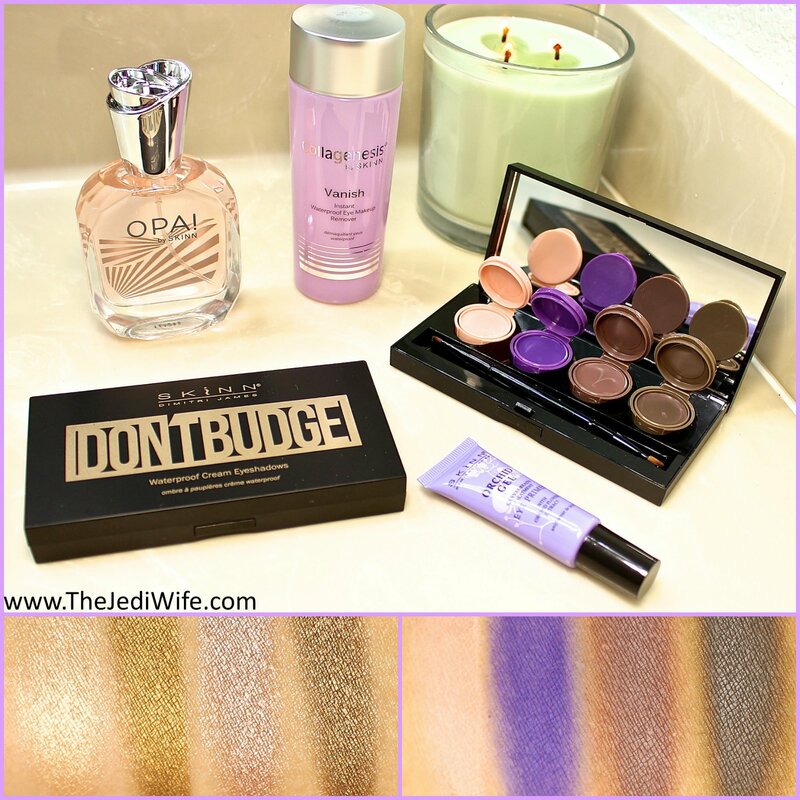 My husband and I celebrated our anniversary last month, and I used the new Orchid Gel Canvas-Ready Treatment Eye Primer with Orchid Flower Extract and several shades from the Don't Budge Waterproof Cream Eye Shadow Palettes (both matte and non-matte) to create my look for our dinner date. Check it out! I also wore the OPA! eau de parfum on our date, although you can't exactly see it in photos. Ha! 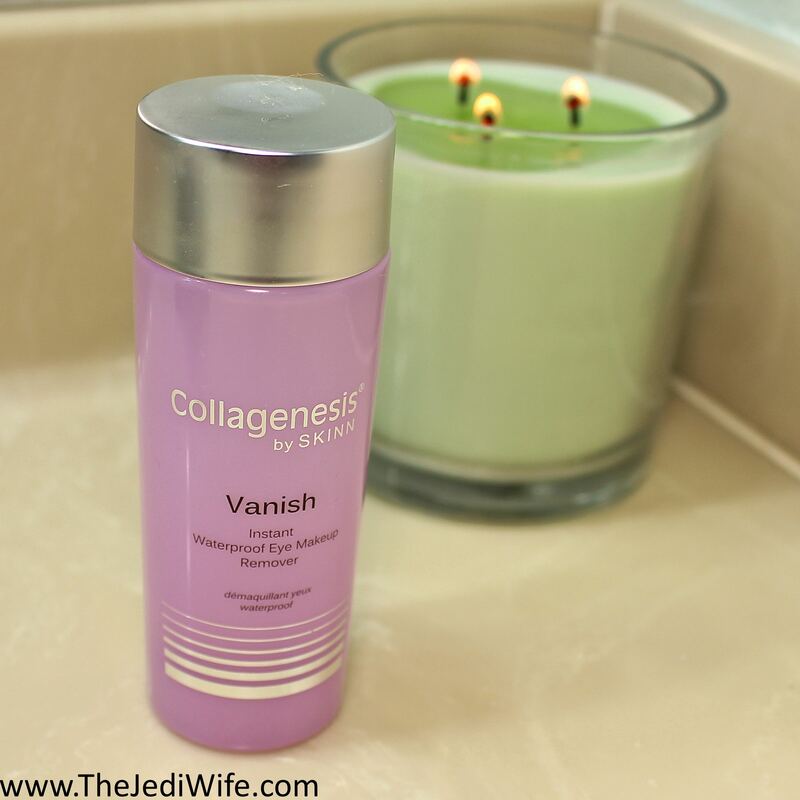 My makeup stayed perfectly in place until I removed it quickly and easily with the Collagenesis Vanish Instant Waterproof Eye Makeup Remover. 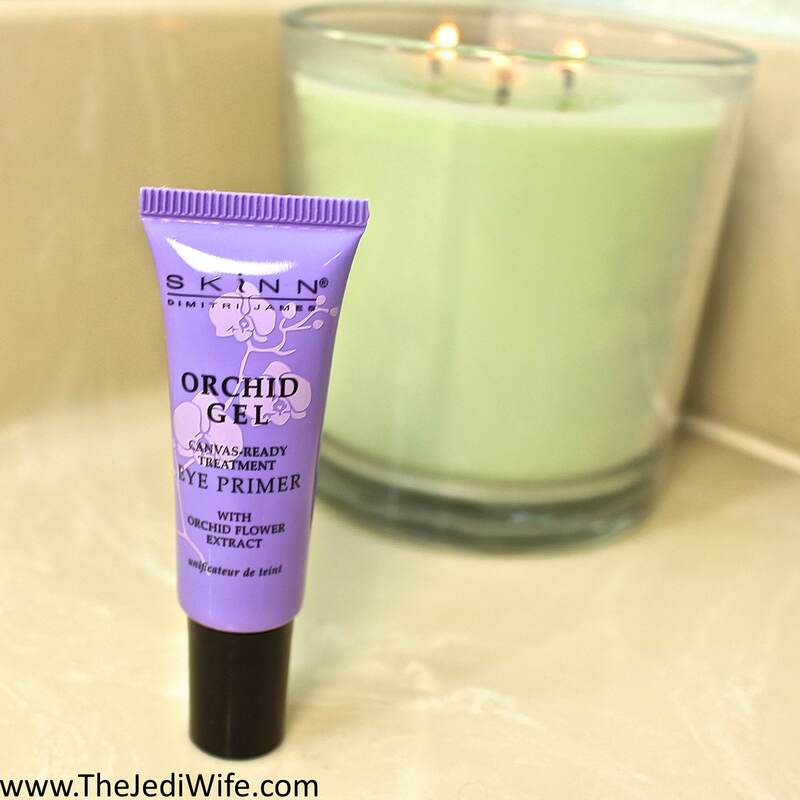 Overall, I am really liking these products from Skinn Cosmetics! 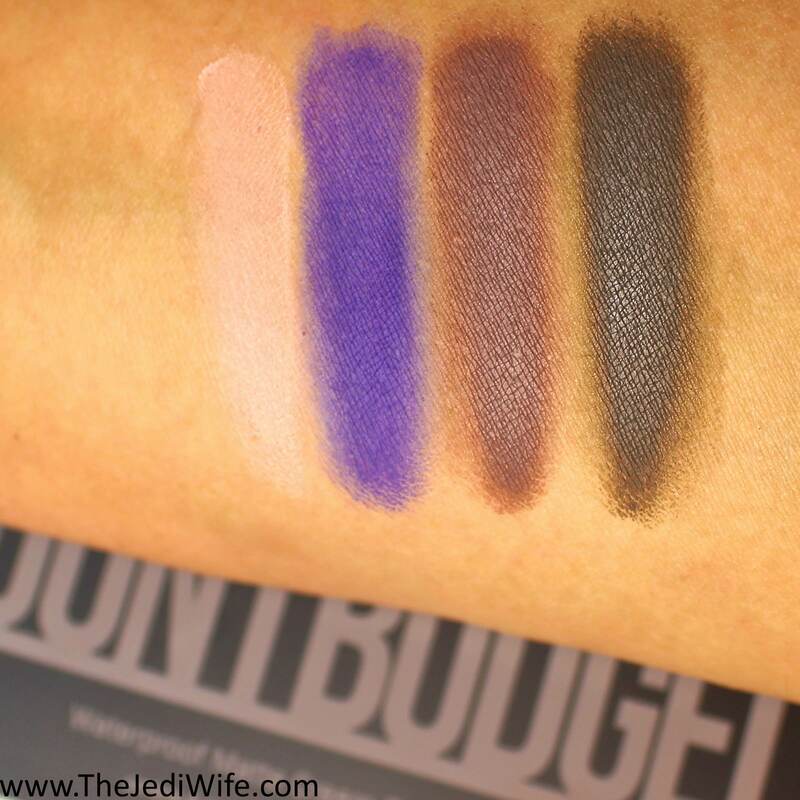 The matte version of the Don't Budge Waterproof Cream Eye Shadow Palette did give me a little trouble, but you can make it work with a little extra patience and buildup. I really love the shimmery version a lot and have been using it often in creating my eye looks! 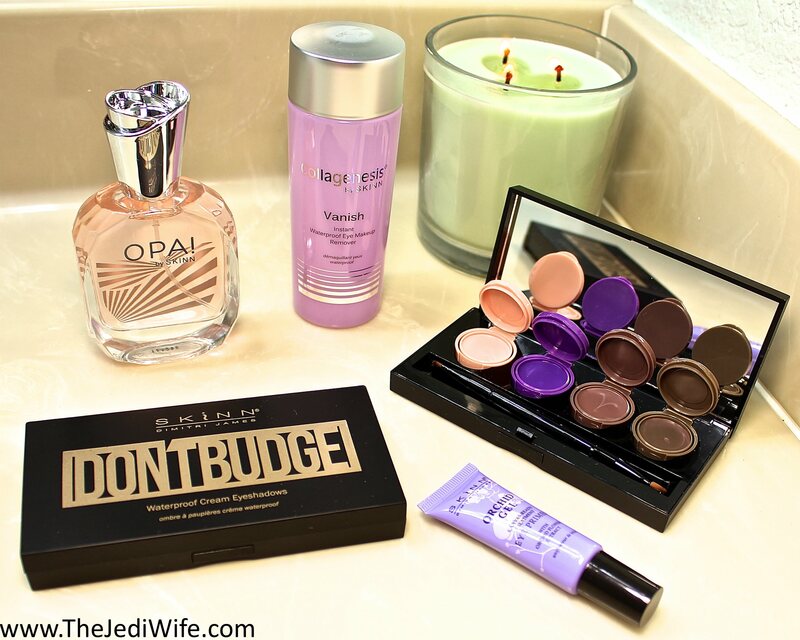 I also really enjoy using the Collagenesis Vanish Instant Waterproof Eye Makeup Remover and the OPA! eau de parfum! These and other items can be purchased at www.Skinn.com. And this, dear readers, concludes today's blog post! I'll have more Skinn Cosmetics products on the blog in the not-too-distant future once I complete testing. Have you used any products from Skinn Cosmetics? What have you enjoyed? Is there anything in particular you are planning to pick up? I'd love to hear from you! Those shadows are beautiful and crazy pigmented! The non matte shadows look fabulous. I'd love to wear those. Did you notice a fragrance in the eye makeup remover? Happy Anniversary!! You looked beautiful for your date!! 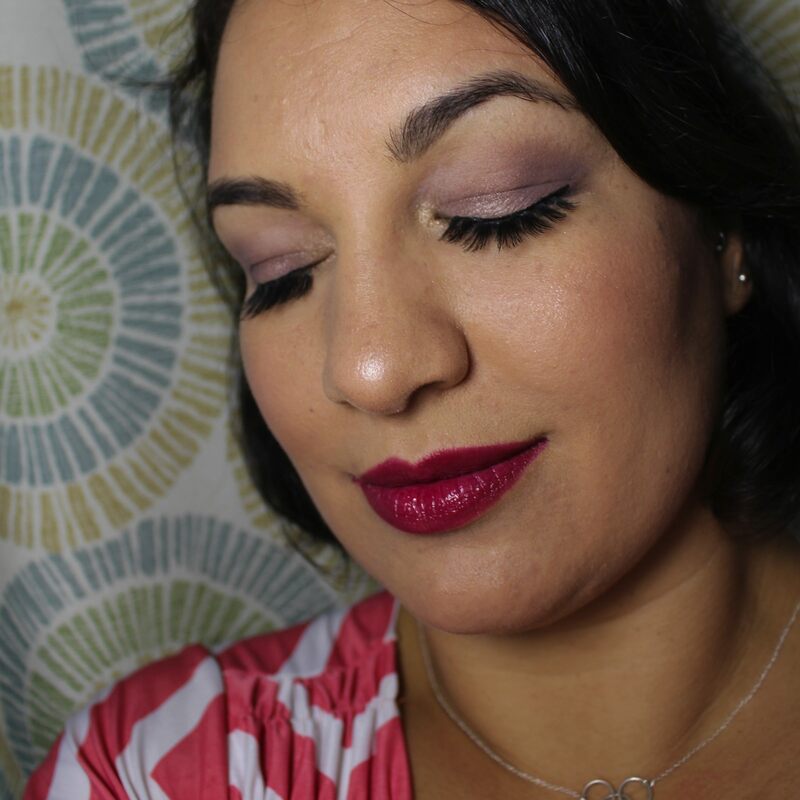 Gorgeous look you created! Can you believe I have never tried cream eye powder? I really like that bronzey eyeshadow! Oh my, those cream eyeshadows are glorious! Loving the waterproof eyeshadow creams!!! Amazing!!! Ooooohhh I'm going to need that eye primer once it's released! Lots of awesome products! The waterproof shadows look amazing!